Ununbium (#112 = Uub) was discovered on 9 February 1996 at 10:37 PM by S. Hofmann, V. Ninov, F.P. Hessberger, P. Armbruster, H. Folger, G. Münzenberg, and others at their Helmholtzzentrum für Schwerionenforschung (Center for Heavy Ion Research) a part of Gesellschaft für Schwerionenforschung (GSI) in Darmstadt, Germany. The atom was produced by fusing a Zinc atom with a Lead atom. To achieve this, the Zinc atom was accelerated to high energies by the heavy ion accelerator, UNILAC, and directed onto a Lead target. 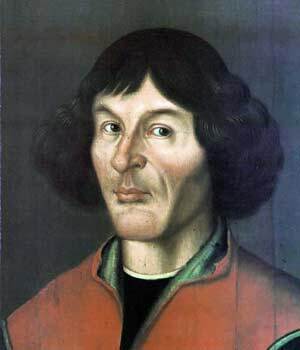 Thirteen years later, after the International Union of Pure and Applied Chemistry officially acknowledged confirmation of discovery, the GSI team suggested the name Copernicium to honor astronomer Nicolaus Copernicus (b1473, d1543),. The element symbol for element #112 should be Cn (after first proposing Cp). Copernicus proposed a system of circular obits and epicycles which included the Earth orbiting a stationary Sun. Copernicus claimed that system matched observations while avoided imperfections of previous theories, thus paving the way for our modern view of the world. Nicholas Koppernigk (born 1473 at Thorn on the Vistula in what eventually became Poland, died 1543 just prior to Galileo's birth; 1580 portrait(?) at right→ from Thorn Town Hall), was a cannon (lawyer) for the Christian Church in Prussia. As an amateur astronomer, her had been concerned that God would not have created the universe to have irregularities such as the equant which Ptolemy had used to speed and slow the motion of planets. So Copernicus (as he Latinized his name) developed an alternative explanation for heavenly motions. Copernicus admitted that Ptolemy's model for the universe did accurately explain all motions and changes of brightness in the heavens. But he believed that God made the heavens perfect in every respect. Seeking to correct what he viewed as Ptolemy's flaw, he realized if epicycles were added to Aristarchos' model of the heavens, the daily motion of the celestial sphere and many of Ptolemy's epicycles would be unneeded. Instead the Earth would be a planet orbiting the Sun just like the other planets. To avoid the need for the imperfect equant, Copernicus had to add as many as seven successive epicycles for some planets. To explain why stellar parallax has not been observed as predicted by Aristarchos' model, Copernicus suggested the stars had to be enormously distant so that the parallax was too small to notice. The retrograde of planets was explained by an inner planet passing the Earth or the Earth over taking and passing another planet. Never the less, Copernicus was able to propose a system of perfect circular motions that could explain every heavenly motion equally well as Ptolemy's model. Copernicus' model was widely discussed by astronomers, many whom believed the lack of any evidence for the Earth's motion still made Ptolemy's explanation better. When Galileo Galilei (b1564, d1642) while a university teacher in Venice, Italy, heard about a device assembled in Holland to magnify one's view, he built such a telescope and viewed the Moon. He saw rough features which he believed to be mountains and valleys much like the rugged surface of Earth. Let me first speak of the surface of the Moon, which is turned towards us. ...I distinguish two parts in it, which I call respectively the brighter and the darker. ...but the darker part ...discolors the Moon's surface and makes it covered with spots. Now these spots, as they are somewhat dark and of considerable size, are plain to every one, and every age has seen them, wherefore I shall call them great or ancient spots, to distinguish them from other spots, smaller in size, but so thickly scattered that they sprinkle the whole surface of the Moon. These spots have never been observed by anyone before me; and from my observations of them, often repeated, I have been led to that opinion which I have expressed, namely, that I feel sure that the surface of the Moon is not perfectly smooth, free from inequalities and exactly spherical as a large school of philosophers considers with regard to the Moon and the other heavenly bodies, but that, on the contrary, it is full of inequalities, uneven, full of hollows and protuberances, just like the surface of the Earth itself. Galileo continued his observations of the sky with his telescope discovering that Venus had phases of darkness just like the imperfect Moon, the Sun had spots, Saturn had what looked like ears, and four small moons orbited Jupiter demonstrating that not all heavenly bodies moved with the earth as the centers of their rotation. Armed with this evidence, Galileo embarked on a drive to convince everyone that the Greeks had flawed ideas that needed to be updated. After being placed under essentially house-arrest for holding beliefs contrary to the teachings of the Church, Galileo wrote a Discourse on Two New Sciences, one of which provided the foundation for a new physics replacing the commonly accepted physics of Aristotle. In the end Galileo succeeded in spurring most of the educated world to replace the old Greek physics and adopt the new model of the heavens described by Copernicus.